In the world of competitive track-based motorsports, it’s becoming increasingly difficult to offer something different from what many have done before. Time attack (competing to clock the fastest timed lap around a circuit) and wheel-to-wheel racing (competing to complete the most laps, or cross the line first in the same number of laps) are time-honored formulas adopted by countless organizations the world over. And for good reason: they can be adapted to suit any worthy vehicle, rules can be objectively enforced and results made certain. Drifting—arguably the world’s newest major form of motorsport—trades some of that objectivity for personal evaluations of style, proximity, smoke and other impossible to quantify but easy to understand criteria necessary for success. But the result is something that’s at once different and works well. For racing/motorsports enthusiasts growing tired of the status quo, who don’t have the desire (or machinery) to kill tires sliding sideways, what’s next? Well, it seems that VTEC Club USA might have just figured it out. Just over two years old, VTEC Club (for short) is all but a mainstay in SoCal’s enthusiast time attack world. Born from a group of Honda loyalists running in Extreme Speed track events and wanting to split off and start their own time attack competition series, VTEC Club has been inviting Honda/Acura-powered machines and drivers (including beginners, as long as they’re willing to learn) to local tracks to compete, and activating with Honda drivers as far away as Michigan’s Gingerman Raceway. There’s enough variety among competitors, new and newly enhanced machines, increasing driving abilities, and other circumstances to keep each round fresh and challenging, but from an outside or high-level perspective, you can only have so many track days at the same tracks, with many of the same cars, before everything seems to blend together. When VTEC Club founder Duane Bada and Redline Time Attack coordinator (and VTEC Club competitor) Amir Bentatou got to talking about it, they decided it was time to add a new “spice” to the VTEC Club event stable. Rules had to be clear-cut, competition fair and wins definite. And if it was something tailored to the mild/moderate street cars common in VTEC Club competition, all the better. That’s when the concept of the Touge Stage was born. Let’s not kid ourselves: driving spiritedly through twisty, narrow canyon roads (called “touge” in Japan) is something SoCal enthusiasts love to do in past-time, but it’s not without its dangers. Think of the VTEC Club Touge Stage as something similar to Best Motoring/Hot Version “Touge Battles,” where Japanese drivers like Keiichi Tsuchiya or Max Orido blast through sectioned-off roads in Japan, only with VTEC Club competitors on SoCal’s most touge-like racetrack: Willow Springs’ Horse Thief Mile (HTM). Not only was this a foreign concept to the modus operandi of SoCal auto racing, the track itself was foreign to many as well. Horse Thief Mile was originally built for motorcycle racing and is narrow, with very tight turns and steep elevation changes throughout. There’s also some unforgiving drop-offs and berms on its edges—just like in the canyons. An all-new sort of event at a new and limiting track for many meant new safety precautions had to be made, so Duane and company added a strict one: Go four wheels off track more than three times throughout the day and you’re done; just once in Touge Stage competition resulted in forfeiture and disqualification. Still, racing is not a thoroughly safe activity, and accidents do and did happen, like when one unfortunate participant over-rotated exiting a turn in practice, ran aground on a steep berm, and rolled his once-clean, daily driven Integra (but thankfully wasn’t seriously injured). Competition for VTEC Club’s Touge Stage—also it’s third time attack competition round for the season—went as follows: Drivers had a few practice sessions, then timed competition began at HTM as it usually does at other tracks. Competitors were divided into five groups based on their vehicles and modifications, and the time attack heats commenced. Times were tallied and points (and prizes!) were awarded in each class, and the Top 16 fastest drivers were then invited to Touge Stage competition, where drivers were grouped in pairs according to lap times, in an “every other” arrangement that paired the fastest driver against the third-fastest, second against fourth, and so on down the line. One run was given to each pair of drivers, with lead drivers being determined by a coin flip. The goal for lead drivers was simply to run the course as fast as possible, while following drivers attempted to finish as close to their foe (without passing) as possible. Rather than a finish line, there was a finish zone defined by two lines, and if any part of the follow car entered the finish zone before the lead car exited it entirely, the follow car won. Round winners advanced on to meet subsequent round winners in drifting-style bracket fashion, until only two competitors remained. As expected, there were more close “photo finishes” than blow-outs, and there were some very tense moments in competition, with competitors pushing the limits of themselves and their machines in pursuit of the win. Win or lose, everyone who came out for the somewhat experimental round had a great time. They learned a little more about driving within their limits, what can happen driving outside them, and how to be successful in a new twist on competition. … And Billy Jang (1:02.995), Brian Salmeron (1:02.955), and Brandon Cruz (1:04.556) in Group N, N1, and N2. 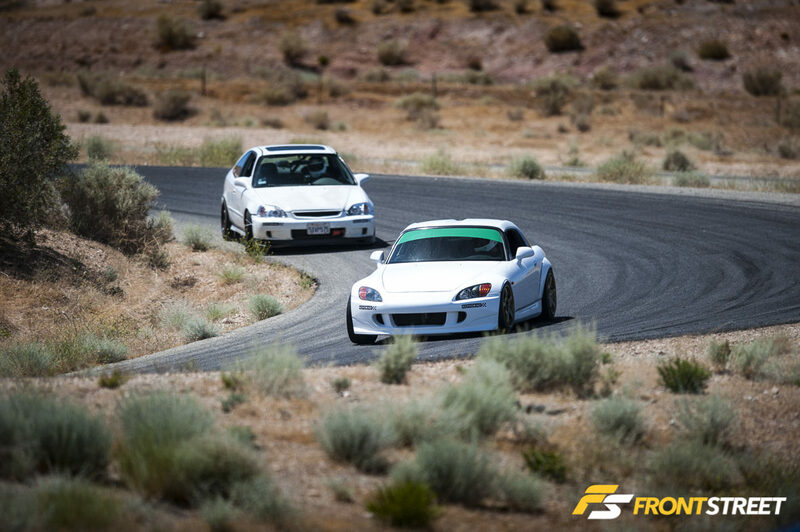 And in the Touge Stage, S2000 pilot Gerry Prieto battled through Robert Blanton (#306 Honda Civic), Brian Salmeron (#77 CRX), Daniel Beachnau (#307 S2000), and eventually two match-ups with Tim Crane in his very fast EK Civic to take the eventual win. With the event in hindsight, it’s fair to say the Touge Stage is here to stay. We expect some improvements will be made prior to the next bout, and VTEC Club time attack business as usual will persist throughout the season with every bit the diversity and excitement as it always has. In today’s motorsports climate, that’s a winning combination. Click through our gallery for lots more from VTEC Club’s rd. 3 event and first-ever Touge Stage, and visit www.vtecclub-usa.com for schedule, classes/rules, and to be a part of the action.